If you are like me, your four legged child is just as important at Christmas time as any other family member. I know there are some people who will disagree with me on that, however for me - that's just the way it is. 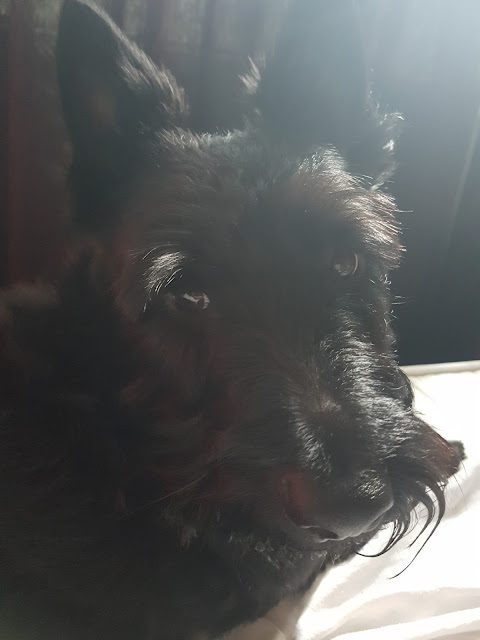 We have had Buddy, our wee Scottish Terrier for around 4 years now and he is very much a part of the family. So when it comes to Christmas, it seems only right to include him in the festivities, doesn't it? Christmas for Bud starts at the beginning of December with an advent calendar, yes that's right, he get's his own doggy advent calendar. I myself have a Playmobil one this year (keeping in touch with my inner child) and my husband has a Kinder chocolate one. We don't do this every year, however it just so happens that this year he also needed a new bed (the dog that is, not the husband!) I mean, what a way to start the festive period, eh? It's plush and comfy and so so soft - if it was a bit a lot bigger I'd maybe even consider lying on it myself! 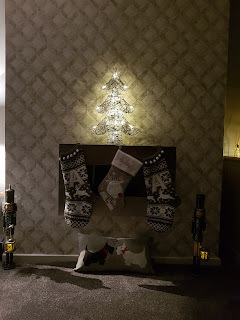 Next are the stockings, I hang one for me, and I hang one for the husband, so of course you know what's coming? I hang one for the dog too! But in this household we don't stop there, oooooh nooo, his stocking is also personalised. It has his name on it. I'm not even sorry. Buddy absolutely adores gravy bones, they are to him what Dreamies are to cats - he'll run through a wall for a gravy bone any day! So there will be few of them going into his stocking alongside a squeaky toy or two. Next up is his Christmas groom, Buddy is currently booked in on Sat 23rd December to have a full wash and groom before Santa comes. I mean you cannot have a smelly dog for Santa - aht aht. He will spend a rather invasive few hours having every inch of his wee body cleaned and tidied and will leave smelling of doggy aftershave and fresh breath. 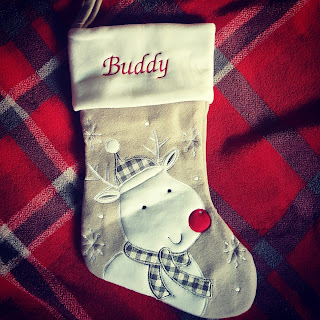 The final part of Christmas for Buddy, is the day itself. As we open our gifts, he will also open his and might receive a lovely new collar and lead, or some new toys and treats. The biggest thing we can give him is a home, a safe roof over his head, somewhere warm to lay his wee head and some food in his tummy, there are so many dogs out there that are mistreated or don't have the love of humans to keep them safe and alive. The very thought of it breaks my heart so I don't think it's a bad thing to want to make him feel extra special and loved at Christmas. If you have a dog, doesn't the thought of that want to make you just snuggle them and never let them go?